Answer: That’s an outstanding photo, Jennifer, and I thank you for sharing it on Sky Lights. It nicely shows the “curtain” structure seen in strong auroral displays. But before I answer your question, allow me to share your photo specs with my readers, many of whom are also photographers: Canon 60D + Tamron 18-50 mm lens, ISO 3200, f/2.8, t = 4 s.
The reason you’re seeing more frequent aurorae is because the Sun’s (approximately) 11-year cycle of activity is now approaching its peak level. More sunspots are present, more frequent ejections of charged particles are occurring, and the solar wind is blowing at a higher speed. There’s a nice chart of the solar cycle here. These charged particles, primarily electrons and protons, stream outward from the Sun in all directions. 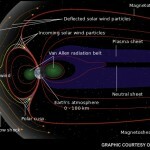 Those that encounter Earth’s magnetic field get “funneled” toward the magnetic poles. In the northern hemisphere, they can trigger the Aurora Borealis (Northern Lights). The southern hemisphere equivalent is the Aurora Australis (Southern Lights). 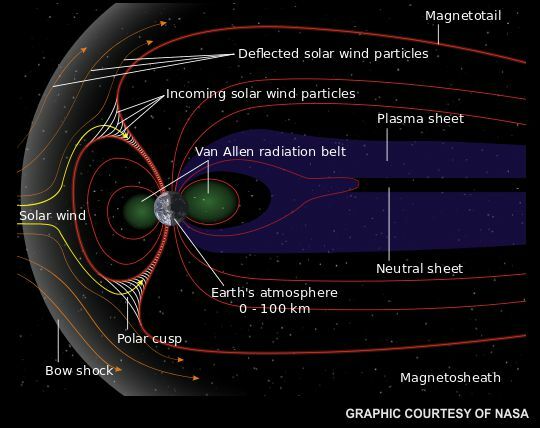 Click on the thumbnail below to see a diagram of how these charged particles interact with the Earth’s magnetic field. When these charged particles plow into the Earth’s atmosphere at high speed (400-800 km/s), they hit molecules in the air with enough energy to stimulate photo-emission. It’s exactly what happens in a fluorescent bulb. 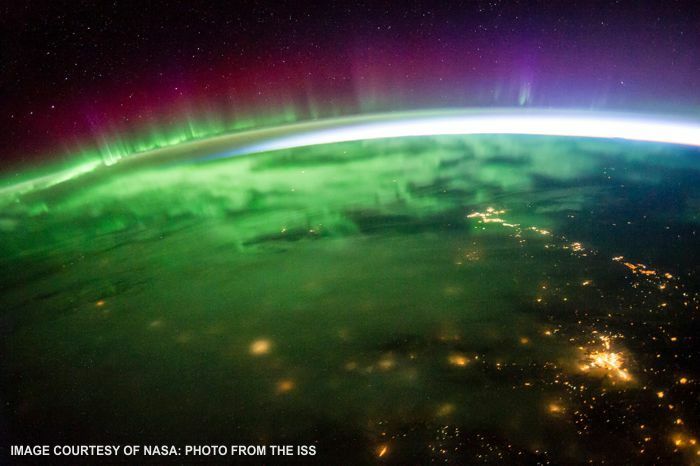 The colors come from both oxygen and nitrogen, the two main constituents of our atmosphere. The yellows and greens in your photo are the most commonly seen, but reds, pinks, and violets can also sometimes appear. That NASA graphic also shows why aurora are more prevalent at higher latitudes (nearer the poles), and why they form those vertical “curtain” patterns — the charged particles are moving downward from the top of the atmosphere. 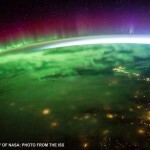 Click on the thumbnail below to see how the aurora appears from space. If you’re a fan of webcams, visit this site. It has a live feed showing the night sky as seen from Yellowknife, Northwest Territories, Canada. 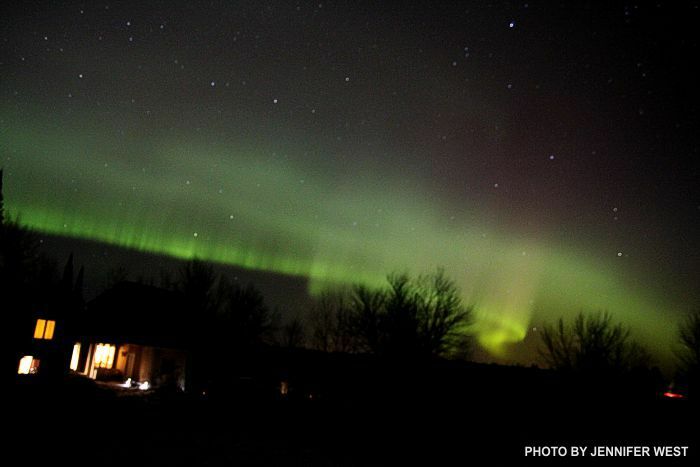 At latitude 62° you can see some awesome auroral displays. Of course, the camera is only on at night, but there are recordings of previous nights available. We rarely see aurorae here in Arizona. We’re just too far south (magnetically speaking). When we do see them, it’s just a faint reddish glow. Never the green-yellow “curtains” like in your photo, at least in the 35 years I’ve been here. But now that we’re at a maximum in the solar cycle, I’ve been checking for them at night just in case. If I get lucky, I’ll post a photo in a future edition of Sky Lights.